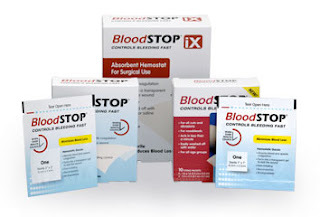 I recently had the opportunity to try the new LifeScience Plus BloodSTOP. 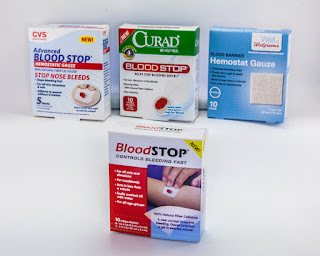 BloodSTOP is an awesome gauze like pad that sticks to a wound and stops bleeding fast. BloodStop is an innovative, life-saving product that every athlete, fitness lover, outdoors enthusiast, coach, and trainer should have in their bag. 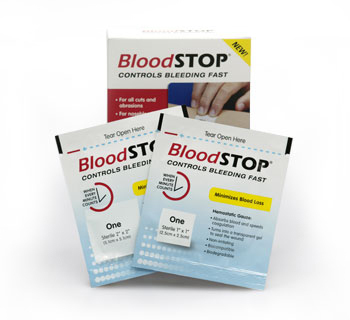 If you are hiking, biking, or doing an obstacle course- I would highly recommend you keep BloodSTOP on hand. My niece hurt herself the day after I received BloodSTOP (kids, go figure) and it was super easy to use, worked amazingly fast & well, and stopped the bleeding fast. You simply place BloodSTOP on the ouchie and you are done. Thats all! Keep reading to learn more. You can find BloodSTOP at major drug stores nationwide or you can order online here. Check out your local Walgreens & CVS stores. This is a product that stops bleeding, prevents blood loss, and seals even serious wounds quickly & easily. Whether you're a fitness junkie pushing their limits, a serious athlete that needs to get back in the game, a cyclist touring long distances, a hiker taking on the trails, or an outdoor enthusiast on the go, BloodSTOP is an absolute must-have addition to your first-aid kit. BloodSTOP® is biocompatible, non-irritating, woven matrices of fibers made from natural plant compounds. It sticks right to your wound and helps the blood coagulate to stop the bleeding. It also forms a protective layer to help your cut or scrape heal faster. Their water solubility allows for removal by rinsing, without disruption of a clotted surface. When applied to a wound, BloodSTOP® quickly absorbs blood and transforms into a gel to seal the wound with a protective transparent layer. Great for kids & adults.